Cheese Process Instrument I Rheolution - Rheolution Inc. Compatible with the dairy industry standards: IP65, NEMA 4X, stainless steel 304. Easy to clean and to maintain. Milk sample is contained into a controlled thermal chamber that maintain a regulated temperature. Temperature set point is sent by the PLC and equals the temperature of milk in the vat. Temperature may be controlled between 65°F an 120°F. 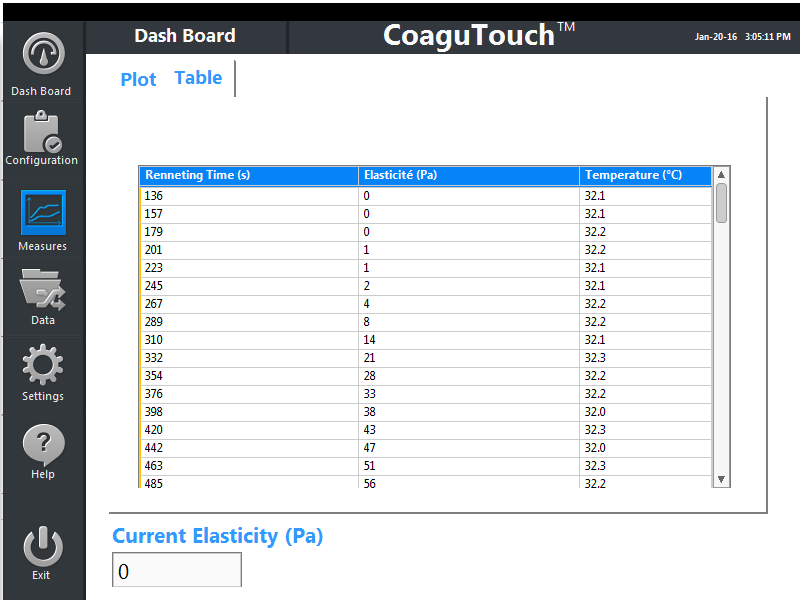 An easy and intuitive interaction with the CoaguTouchTM software to set, start and visualize in real time the firmness of milk during coagulation. 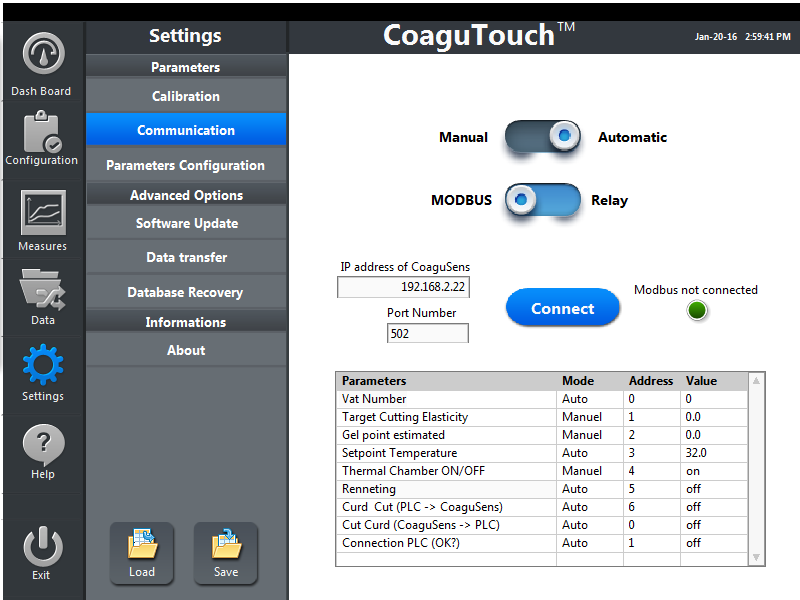 CoaguTouchTM allows CoaguSensTM to communicate continuously with a PLC-based control system. During the coagulation of milk, once the curd reaches the optimal elasticity, a signal is sent to the automation system to start the cutting step. CoaguSensTM uses a new patented technology that combines gentle vibrations and a laser contactless probe to measure the elasticity (firmness) of the curd during coagulation. Many factors influence milk coagulation : cheese recipe, rennet and culture activity, milk microbiological composition and origin (race of animals, region), quality of the feed, season (water consumption of livestock), etc. Because of that, it is impossible to predict the exact flocculation time, hardening speed and firmness of milk curd during the coagulation kinetics. In cheese making, this variability significantly affects the curd firmness at the critical cutting step. Solids retention from milk to cheese, and consequently cheese yield, are dramatically influenced by the variability of cutting firmness. To resolve this problem and overcome the limitations of currently available qualitative devices and techniques, Rheolution developed CoaguSensTM: the first and unique instrument that measures in real time the evolution of firmness of milk during enzymatic coagulation or fermentation of milk. CoaguSensTM is an instrument installed near coagulation vats (at-line). 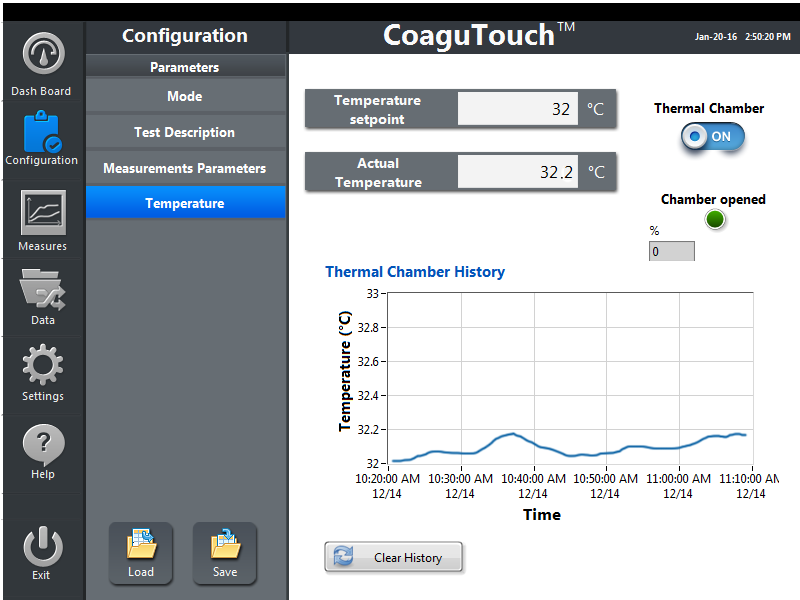 Using a robust industrial touch screen, it runs CoaguTouchTM, an easy to use software environment allowing to interact intuitively with CoaguSensTM. CoaguSensTM– Standalone is not connectable to production automates and is fully operated by the cheesemakers as a standalone instrument. The cheesemaker decides when to cut the curd and activates this important step manually. CoaguSensTM– Connect is also operated by the cheesemaker but is connectable to production automates and is capable of exchanging data (vat temperature, renneting time, batch number, vat number, recipe code, etc.) and to trigger curd cutting automatically. 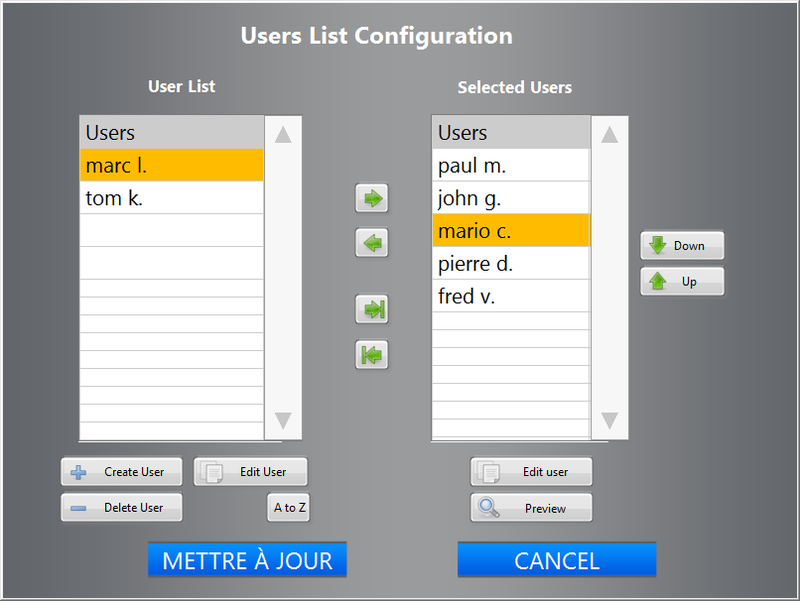 The Connect version comes with extended specifications as compared to the Standalone version. Comment optimiser le rendement fromager dans l’industrie avec CoaguSensMC ? 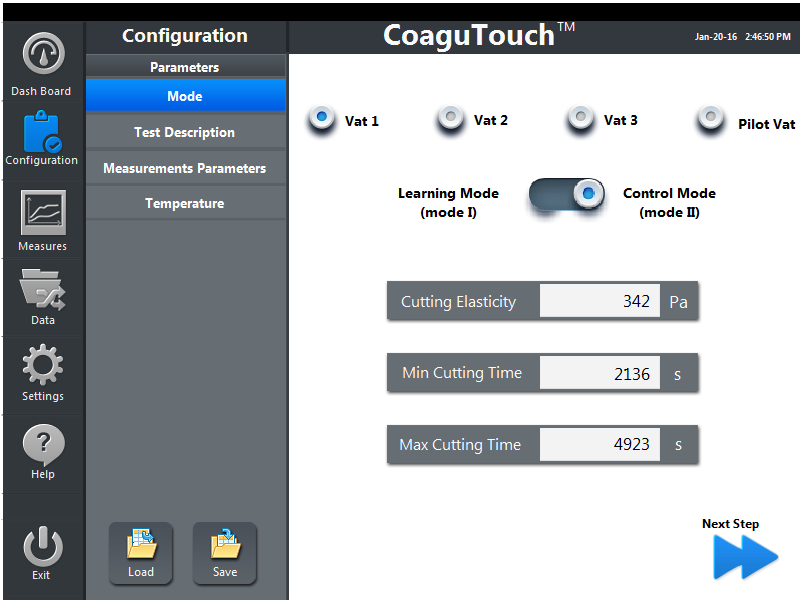 The functions of CoaguSensTM may be monitored using the built-in CoaguTouchTM software. 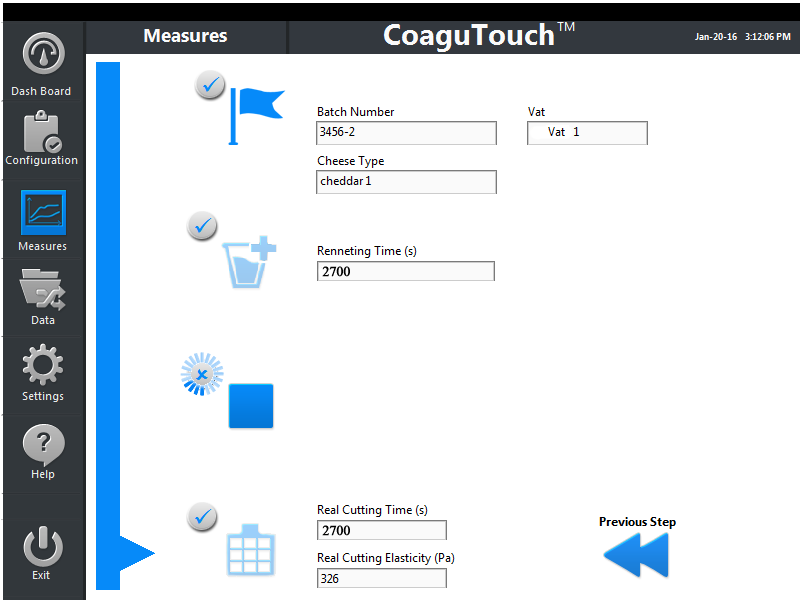 The ‘process calibration’ mode of CoaguTouchTM is used to create a database containing the evolution of curd firmness for a specific cheese recipe. The statistical analysis of the database allows to determine the optimal cutting firmness that delivers improved retention rate and yield. In the ‘process control’ mode (available only with CoaguSensTM –Connect), CoaguSensTM communicates continuously with a PLC-based control system. The optimal cutting firmness determined during the ‘process calibration’ phase can be entered by the user, loaded from the plant internal database or pulled automatically from the network. In production, during the coagulation of milk, once the optimal firmness is reached by the curd, a signal is sent to the automation system to start cutting the curd. List of cheese recipes produced in the plant. 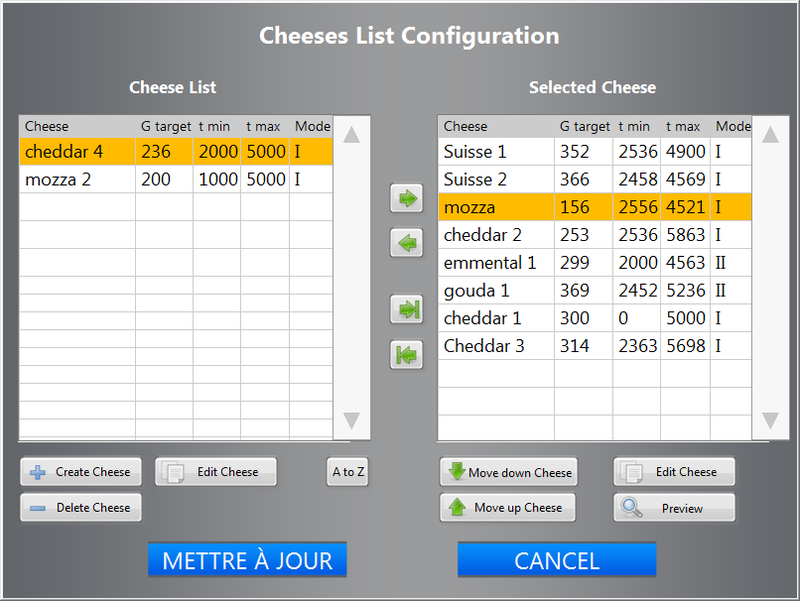 Cheese recipes cutting parameters: target firmness, minimum and maximum time for cutting. Cheese/recipe specific maximum coagulation time. List of cheesemakers & production operators. 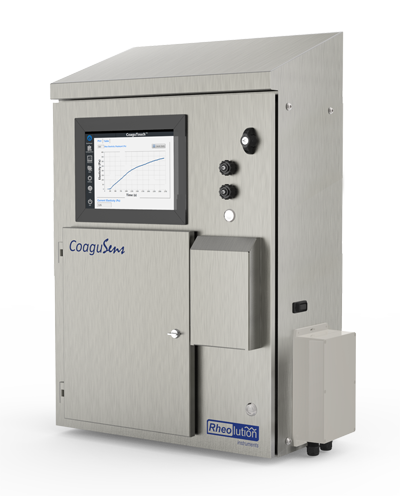 CoaguSensTM is a process control instrument that measures in real time, without contact and non-destructively the shear viscoelastic modulus (firmness) of milk gels as a function of time during coagulation. 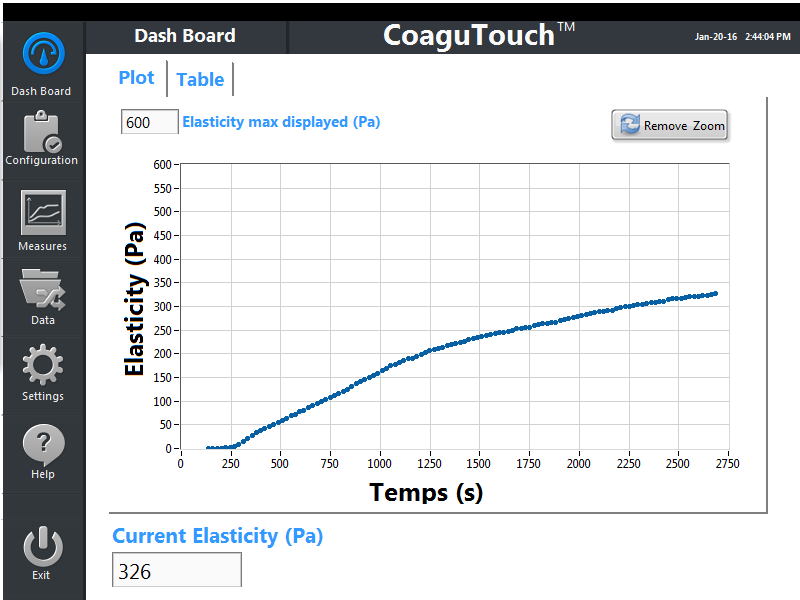 Contrary to optical and thermal technologies, CoaguSensTM measures the absolute curd firmness of the milk gel during coagulation. The patented technology behind CoaguSensTM is purely mechanical. A small amount of renneted milk is sampled from the coagulation vat and poured into a disposable sample-holder that has a flexible membrane at the bottom. A very gentle vibration (only a few micrometers) is applied to the sample and its response is measured without contact by a laser probe. The sample response is processed using a special mathematical model to calculate gel firmness. This process is repeated over the course of the coagulation kinetics at the frequency pre-set by the cheesemaker user. Physically, once the sample is poured into the detachable sample-holder, the material and the flexible membrane form a composite and soft body able to react to external vibrations. This is made possible by the nature of the membrane that is flexible. When a test is started, a low frequency-amplitude vibration is transmitted to the sample-holder connected to the vibrating unit. The composite body formed by the sample-membrane system freely vibrates in response to this dynamic excitation. The only unknown variable in the system, the viscoelasticity (firmness), can be deduced since all other parameters are known. The composite body’s vibrational response to the stimulus is influenced by the material viscoelasticity, a physics which is exploited by CoaguSensTM to measure the sample mechanical properties during a phase changing kinetics or at a steady physical state.